Abstract: The author studied the effects of the degrees of physical and physiological maturity on the physical quali-ties of 54 teenage male basketball players at a life age ranging from 15.0 to 16.9. Height and weight were selected as physical indexes; the degree of physiological maturity was evaluated via clinical checkup. 7 physical quality tar-geted test contents were respectively 30m run, body bending forward from a sitting position, cross jump, 20m x 28 shuttle run, 60s sit-up, chest ball pass with both hands in a sitting position, and squat jump. Basketball players with different degrees of physiological maturity were compared by means of covariance analysis (controlling life age); the relations between physical qualities and physique and the degree of physiological maturity were analyzed by using multivariate linear regression. 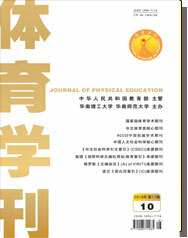 The research results indicate the followings: physical qualities are irrelevant to the degree of physiological maturity to a great extent; life age has an obvious predicting function on 4 physical qualities (body bending forward in a sitting position, cross jump, 20m x 28 shuttle run, chest ball pass with both hands in a sitting position); the degree of physiological maturity has an obvious predicting function only on 20m x 28 shuttle run and squat jump; weight and the interaction of weight and height show a negative correlation with 20m x 28 shuttle run and squat jump respectively.